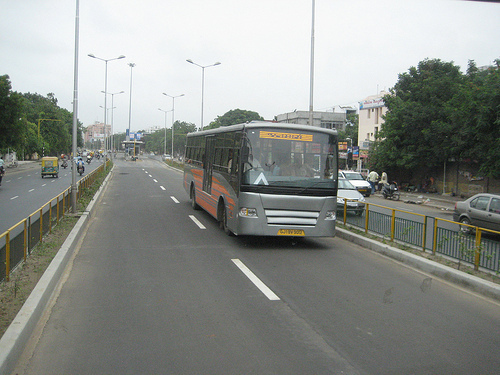 Ahmedabad's BRT system, known as Janmarg, is a model for other cities to follow. Photo by Madhav Pai. Ahmedabad has set a new standard for Bus Rapid Transit (BRT) in India. That was the consensus at a recent capacity-building workshop educating other city officials about the planning and implementation of the local BRT. The five-month old system, popularly known as Janmarg, is the first full BRT in the country. To provide some insight into the success of BRT in Ahmedabad, Madhav Pai of the Centre for Sustainable Transport in India (CST-India), a member of the EMBARQ Network, published before-and-after reviews of the system on India Together. The first phase of the Delhi metro is 64 kms…[and] the completion cost was Rs.10,571 crores [approximately $2.3 billion]. That’s a whopping Rs.165 crores [$36 million] per km. The Bangalore metro project, which recently got off the ground, will be similar in cost; its projected cost of Rs.6500 crores [$1.4 billion] at today’s price levels works out to Rs.178 crores [$39 million] per km, even without accounting for the cost escalation. Almost certainly, the completed cost will be higher. Higher costs for Metros may be acceptable, if they are accompanied by substantially higher benefits to the transport infrastructure’s current woes. But look at how Delhi’s Metro is functioning. The expected ridership in 2005 was 15 lakh [1.5 million] passenger trips per day. Today, after more than a year of being in service, the system actually gets about 4.5 lakh [450,000] passengers a day. A few days ago, Pai again reviewed Janmarg after several months of operation. The corridor is now 24.5 kilometers long, and technological improvements, such as smart cards, passenger information systems, and signaling systems, are in place. Ridership has increased to 35,000 passengers per day on weekdays and 40,000 passengers per day on weekends. The system also includes electronic fare collection, centralised control and user information systems. As Pai points out, Ahmedabad has set a high standard for BRT in India. With Janmarg as evidence that investments in bus-based solutions are affordable and quickly converted into value, it is hoped that other city officials throughout India will see the merits of BRT.